Britain may have been the country that invented the armored fighting vehicle known popularly as the “tank,” but after the First World War, the British Army fell behind the rest of the world in the development of tanks, seeing them only as the infantry support vehicles they had been in the Great War. By the outbreak of the Second World War, English tanks were outperformed and outgunned by their German opponents. Following the exposure of Britain's armored inadequacy in the Battle of France, it was imperative that a new tank be developed. With the obsolescence of the Crusader tank revealed in the armored battles in North Africa in 1941 following the combat introduction of the Afrika Korps, the introduction of a new tank became a top priority. Only the provision of the American Sherman tank through Lend-Lease kept the British Armored Divisions able to carry on after 1942. Officially known as the Cruiser Tank, Mk VIII, Cromwell (A27M), the new British tank was named after the English Civil War leader Oliver Cromwell, and became the most successful series of cruiser tanks fielded by Britain in World War II. It was the first British tank to combine a dual-purpose gun or large enough size to threaten German armor, with high speed, and reasonable armor protection. Introduced in 1943, it was the tank Britain had needed in 1940. It was not until the Mark IV was introduced in early 1944 that the Cromwell was sufficiently developed to enter combat, first seeing action in the invasion of Normandy. Unfortunately, the delays in developing and introducing the Cromwell meant that it would never fully replace the Sherman, and that it was seriously outclassed by later German armor. It was not until the introduction of the Comet in early 1945 - developed from the Cromwell - that the British Army finally fielded a tank that was the equal of the opposition. The Cromwell was powered by a new engine called the Meteor, which was based on the Merlin engine used in aircraft. Rolls-Royce, could not spare the facilities for the Meteor, and manufacture of the engine was passed to the Rover Car Company. With this powerplant, the Cromwell was the fastest tank to serve in the Second World War, with a top speed of 40 mph, which proved too much for the Christie suspension, with the result that the engine was governed to give a top speed of 32 mph, which was still fast for its time. 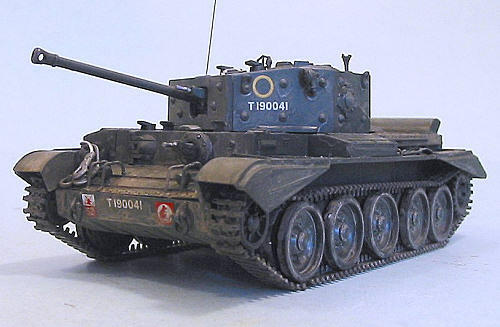 Thanks to the Christie suspension, the Cromwell was very agile on the battlefield. Originally equipped with a 6-pounder (57 mm) cannon the design was upgraded in 1943 to the ROQF 75 mm gun, which was an adaptation of the 6 pounder design to fire the ammunition of the US M3 75 mm cannon. While the Cromwell was faster and had a lower profile than the Sherman, and its armor was of equivalent thickness, it was less sloped and therefore less effective than the Sherman. The 75mm gun, while could fire a useful HE shell, was not as effective against enemy armored vehicles as the 6-pounder or the 17-pounder that was fitted to the Firefly variant of the Sherman. The Cromwell only fully equipped one division, the 7th Armoured Division. The Cromwell was also used in the reconnaissance battalions of British armored divisions due to its speed. It only saw combat in northwestern Europe between D-Day and V-E Day. 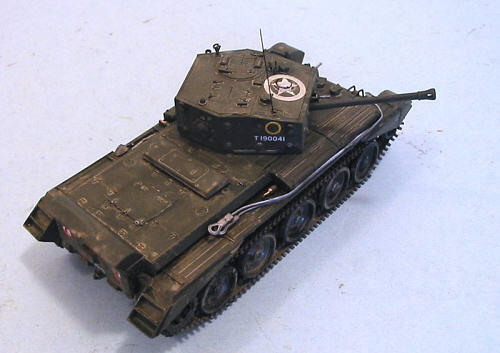 This kit by Tamiya is a scale-down of the 1/35 scale kit of the Cromwell Mk.IV, which was one of the better releases in that scale. The kit represents the Type C hull Cromwell with the left side opening hull hatch and the ROQF 75mm main gun. It consists of 158 parts in olive drab plastic molded to the usual high standard with crisp clean detail and no flash with a bare minimum of pin marks. 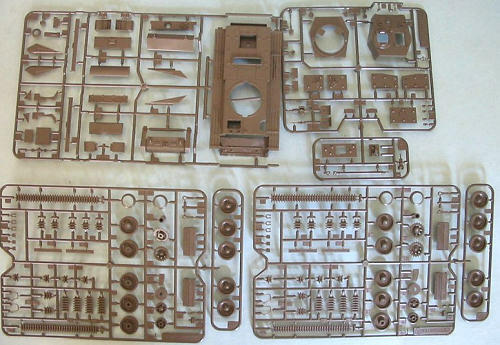 This new kit has many of the same assembly sequences, and at least one similar mistake to the large kit, in that the upper portion of the tracks should not sit atop the road wheels as they do. Those who are concerned with accuracy will have to modify the parts A19 and A24 so the tracks will be tensioned properly. Overall, this was perhaps the easiest of these Tamiya kits I have built, though there were some fit issues regarding the attachment of the upper plastic hull to the lower diecast hull, with some gaps at front and rear. I filled these with white glue and had no problems otherwise. The kit was built over a weekend as a diversion from a screenwriting project I am currently working on, using it as a break when I would be stuck with a scene I was working on. As with most of my other Tamiya tanks, I assembled the upper hull with all its parts and the turret as separate sub-assemblies, leaving the wheels and the tracks on the sprues until I had painted everything before assembling the lower hull sub-assembly. I used several shades of dark green, starting with Xtracrylix RLM71 Schwartzgrun, then Xtracrylix RAF Dark Green. I think this approximated the color of British tanks in the later stages of the war. 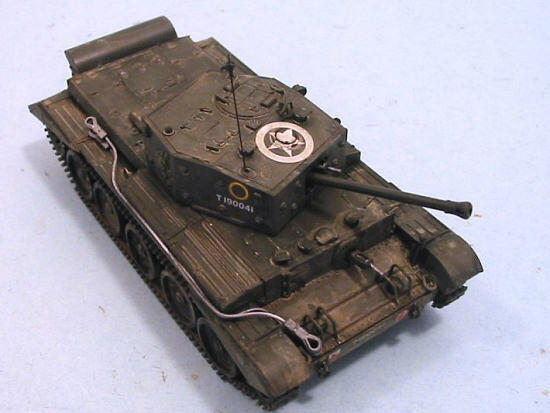 I used the kit decals to do the Cromwell operated by C Squadron, 5th Royal Tank Regiment, 22nd Armored Brigade of the 7th Armored Division in Normandy in the summer of 1944. I applied a light coat of thinned Tamiya “Mud” from the Tamiya weathering master set, to give the tank the look of a Cromwell operated in Normandy that summer, which had quite a bit of rain, which covered the vehicles with mud that later dried out. Once that was dried, I assembled the road wheels and drive wheels to the lower hull, and then attached the tracks, which gave no trouble. It was only after I had completed the model that I discovered the tracks to not actually look this way on the real thing, but by that point it was too late to change things, and I’ll bet most people who see it won’t know that if I don’t tell them. I attached the upper hull with screws and then discovered the gaps fore and aft, which I filled with white glue since it dries clear and (mostly) invisible. I then attached the tools and towing cables. I attached the turret and used a piece of .010 wire for the radio antenna. Another nice kit with good detail, that’s easy to assemble from Tamiya. The incorrect sit of the upper tracks needs attention, but otherwise this is a nice model of the Cromwell. Its relative ease makes it a real “weekend project” if you’re looking for something that won’t take forever. A good cure for AMS that looks nice sitting next to the other models in this series.